The Holy Rosary has never been tied to any time, place or people, nor did it arise from any human culture. Like all true liturgy, it had no earthly origin. He, who tampers with the Rosary, tampers with the work of God. Some try to modernize the Rosary, suppress it, change its form, mutilate it and denigrate it. Like the ancient Sacrifice of the Mass, it continues to live its own life, quietly and serenely amidst the turmoil of our day. We have called the Rosary, the Ultimate Liturgy and so it is. It is no sentimental paraliturgical practice developed over the centuries. It is Our Lady’s Psalter. Known through history as the Layman’s Breviary, the 150 HAIL MARY are said in lieu of the 150 Davidic Psalms of the Divine Office. Where the Office is the Opus Dei, the work of God, the Rosary may be called the Opusculum Dei, God’s little work. Like the Divine Office, it is rooted in the universal, divine injunction to pray without ceasing and was designed by Her to facilitate this duty for those unable for whatever reason to recite the Office. So well was that understood by the faithful when the Rosary was first propagated by St. Dominic, that for a long time its recitation actually began with the Aperies as does the Office. Even today, it still closes with the Hail Holy Queen – the Salve Regina with which the Office closes. The Rosary is not just one devotion among many. It is a super devotion, the only one ever formally raised to liturgical status on par with that of the Sacred Heart of Jesus. It has its own proper feast, October 7, instituted with a proper Office by Pope Gregory XIII. It was inserted into the Roman Martyrology by Pope Clement VII and later extended to the Universal Church by Pope Clement XI. Pope Benedict XIII added it to the Breviary, and Pope Leo XIII, the Pope of the Rosary, dedicated the entire month of October to the Holy Rosary. Pope Pius V, who for all time canonized the Order of the Mass by the famous Bull, Quo Primum in 1570, had already promulgated a similar Bull for the Holy Rosary entitled Consueverunt. After reaffirming the tradition relating to St. Dominic and officially entrusting the propagation of the Holy Rosary to his spiritual sons, the document established canonically the form in which the Rosary was to be prayed; 150 HAIL MARY in groups of ten with the OUR FATHER in between, joined to meditation on the 15 mysteries of the Life of Our Lord. Nothing was created or changed; the devotion was merely codified with the full authority of his office defining the proper form, giving obedient testimony to the work of the Holy Ghost, Who is the Principal Author of all Liturgy. The devotion was not left open to possible variations. The Rosary was not fabricated piece by piece like a machine, but grew organically in space and time. Under divine impulsion, it issued forth from the Archangel Gabriel’s greeting to Mary, as a living plant grows from seed, in accordance with both natural and supernatural laws. 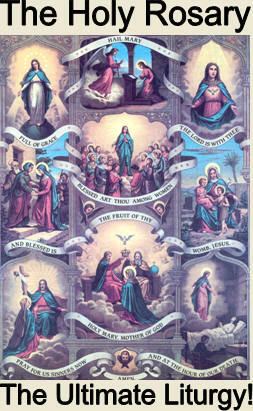 The HAIL MARY was given to the world even before the Lord’s Prayer. Certainly, it was no new practice which Our Lady brought to St. Dominic, but one perfected over the centuries by the Holy Ghost with Her cooperation for the special exigencies of the Latter Days. There are those who say the Rosary is not sufficiently Christological, but it must be pointed out to them that the climax of every HAIL MARY is not Mary herself, but ‘the Fruit of Her womb, Jesus!’ No prayer is so firmly rooted in Apostolic tradition as the Rosary. The 15 principal mysteries of the Faith flow naturally from the meditation on the Psalms. Far from modern accretions, these meditations were among the Rosary’s most ancient elements. They reproduce the Church’s essential liturgical cycle, and carry the worshiper through the entire history of Redemption. The Rosary is the most powerful weapon, the Ultimate Liturgy! At all times and in every place, it opens the graces flowing freely from the Divine Head of the Mystical Body through the mediation of His Mother, to us His members. The persecuted Christians of Ireland were on solid doctrinal ground when they resorted to the Rosary as their dry Mass. As the number of priests dwindles, churches close down and the Liturgy breaks down, it is good for us to remember this. Pope Leo XIII and Sister Lucia of Fatima have both attested that Our Lady invested the Rosary with special efficacy: the repetition of the AVE MARIA, PATER NOSTER and GLORIA PATRI is the chain that lifts us right up to God, unites us to Him and obtains for us a participation in His Divine Life. The Apocalyptic Mission of the Rosary was prepared from eternity and it seems always to keep pace with the surges of evil. Our Lady appeared to St. Dominic at the time of the Albigensian Heresy. The victory was decisive and the devotion spread like wild-fire! Swelling with the growth of Confraternities, the Rosary became the prayer of the whole Church. It was intimately associated with the discovery of America and all that followed upon it. The defeat of the Turks at Lepanto was a great Rosary victory! 3. The lethal forgetfulness of future life must be dispelled by ordering all human endeavor to the Glorious Mysteries. This entry was posted on Tuesday, January 1st, 2013 at 2:02 am and is filed under NewsFlash, Saint Philomena. You can follow any responses to this entry through the RSS 2.0 feed. Both comments and pings are currently closed.